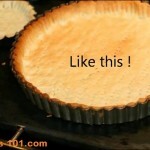 Homemade Vanilla Custard can also be called Pastry Cream and sometimes Vanilla Pudding. This custard is used in various different baked items. Cream puffs, chocolate eclairs, Boston Cream Pie, various pastries and it is just so good by itself as a pudding/custard. Since this is an egg based product with preservatives it remains perishable even after cooking. So it must be cooked down to refrigerator temperature (under 40ºF/5ºC) with in an hour. And it should not be left out at room temperature for over an hour. This recipe came from my good friend Gretchen Price whose current blog is GretchensBakery.com (Her Facebook page is Gretchen’s Bakery). Gretchen had a former website CrumbBoss.com and she was a former owner of Woodland Bakery and ran the WoodlandBakeryBlog.com until 2015. Gretchen is a Pastry Chef. Visit her site and support her. She has many excellent recipes and is a great teacher. Catch her videos on YouTube at Gretchen’s Bakery. Gather all your ingredient before you begin. I say this every time and you see I have all my ingredient laid out. This way I do not forget anything. In the heat of battle that is so easy. And having everything laid out means the whole process goes quicker. Remember measure twice and double check to make sure you do not ruin the recipe. We start with putting the milk, 1/4 of our sugar and a vanilla bean split down the middle the long way into a pot on the stove. Turn the heat on to medium so it can come to a simmer. Meanwhile, add the eggs, egg yolks. remaining sugar, and cornstarch into a work bowl and stir with a whisk. Heat the milk, the vanilla bean and some sugar on the stove until simmering. Meanwhile. add the eggs, egg yolks, remaining sugar and cornstarch to a bowl and whisk until combined. Once the milk mixture comes to a simmer we need to add it to the egg mixture, however we can not just dump it all in or we end up with egg soup. So we just add a little of the hot milk mixture to the egg mixture and whisk it well, then add some more milk, whisk and we keep repeating until about 1/2 the milk mixture has been added. 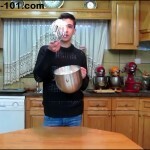 At this point, pour the egg mixture back into the pot and return the pot to the heat and whisk constantly until the mixture comes to a boil. Once the milk mixture is simmering, you need to temper the egg mixture by adding in a small amount of the hot milk mixture and whisking the egg mixture. Repeat adding more milk in small amounts until about half of the milk mixture has been incorporated. Now add the egg mixture to the milk mixture in the pot whisking constantly. Return the mixture to the stove and heat to a boil and the mixture thickens. Stir constantly. Once thickened, remove from the stove and add in the butter. Stir well to mix. 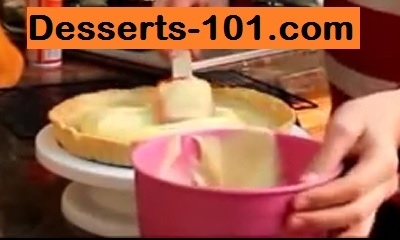 Strain the custard to catch the vanilla bean and any scrambled bits of egg into a shallow pan. Cover the mixture with plastic wrap. Chill the mixture by placing it in an ice water bath or the refrigerator to cool it rapidly. This custard is highly perishable and must be refrigerated. There can be debate as to putting a hot mixture into the refrigerator. This recipe was initially designed for a commericial kitchen and the amount added was not a problem. So we can place the shallow container into a larger container container ice and water to cool it down. Then place it in the refrigerator. In a pot, place the milk, 1 ounce of sugar and the split vanilla bean. Place on the stove on medium heat. Heat to a simmer. In a blow place the egg, egg yolks, granulated sugar and cornstarch. Once the milk mixture comes to a simmer, it needs to be added to the egg mixture, however you just can not pour it in so we have to temper the eggs first. To do this, add a small amount of the milk mixture to the eggs and whisk. Add some more milk and keep whisking. Repeat this process until you have half of the milk mixture added to the eggs. At this point, add the egg mixture to the milk mixture in the pot. Bring the mixture to a boil. It should thicken up. Remove from the heat and add in the butter. (If you did not use the vanilla bead, add your vanilla extract at this time.) Stir well to incorporate. Strain the mixture through a strainer to capture the vanilla bean and any bits of eggs that cooked. Place a piece of plastic wrap on top. This mixture must be cooled down rapidly. You can place it in an ice water bath for it to chill then into the refrigerator. Note #1. If you do not use a vanilla bean, add the vanilla extract when you add the butter after the custard has thickened and taken off the stove.